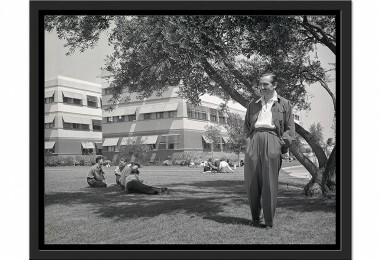 Winnie the Pooh and his creator, A. 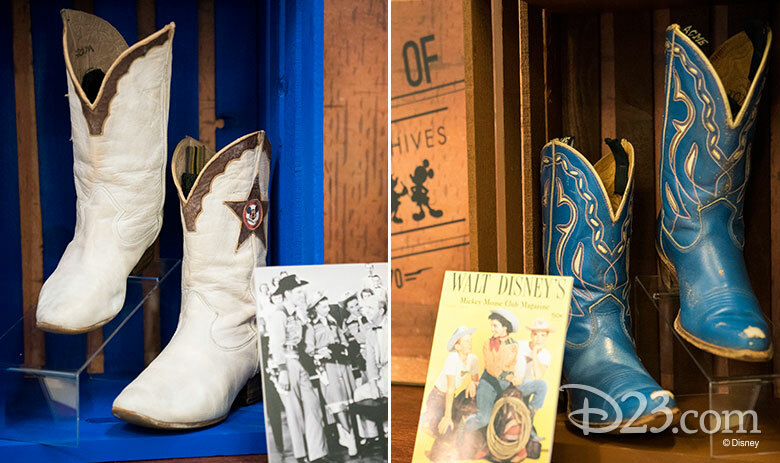 A. Milne, would be happy to see how many “big boots” and tales of “adventure” are on display in the latest Walt Disney Archives exhibit. 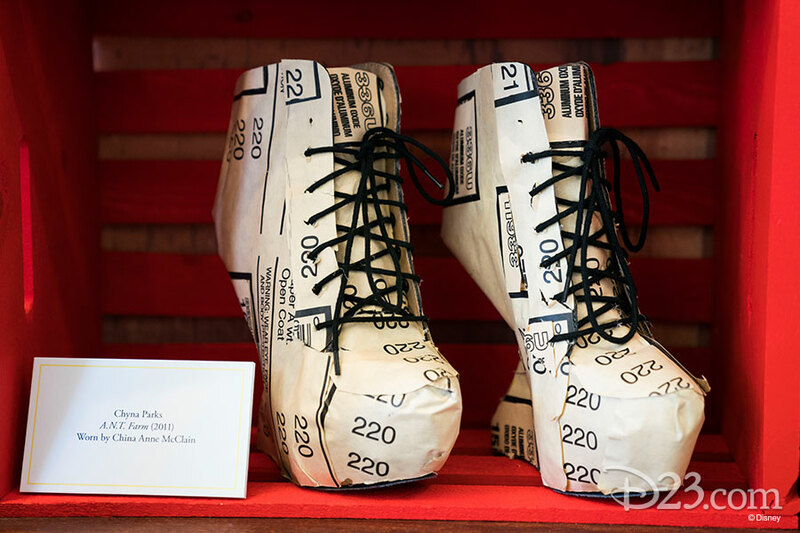 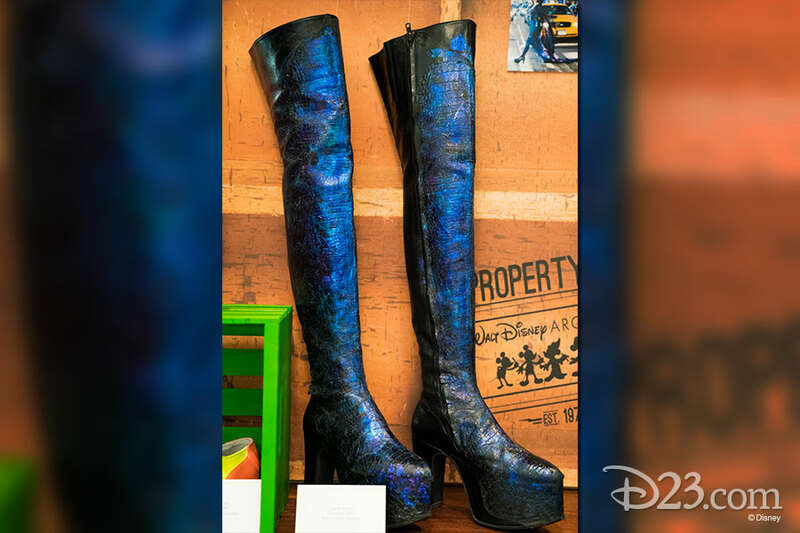 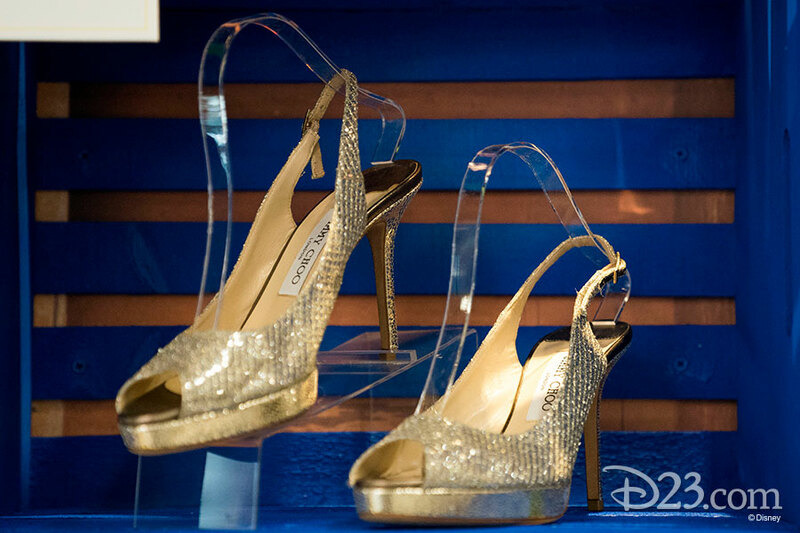 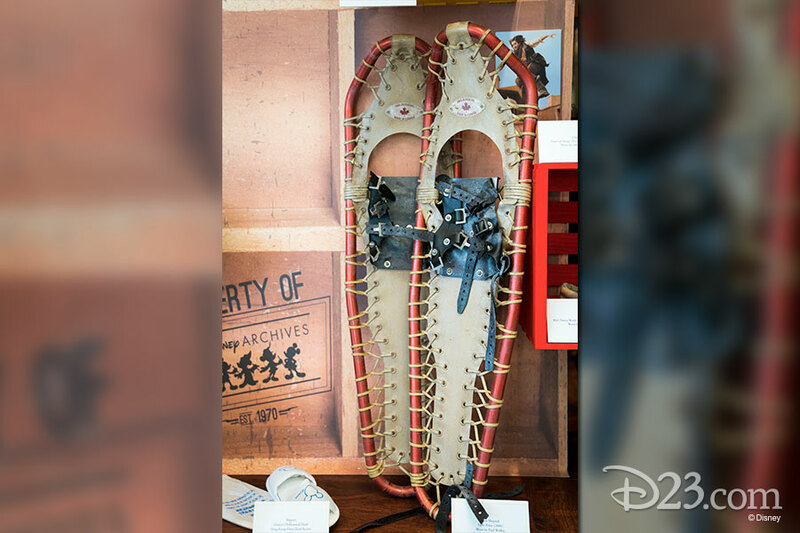 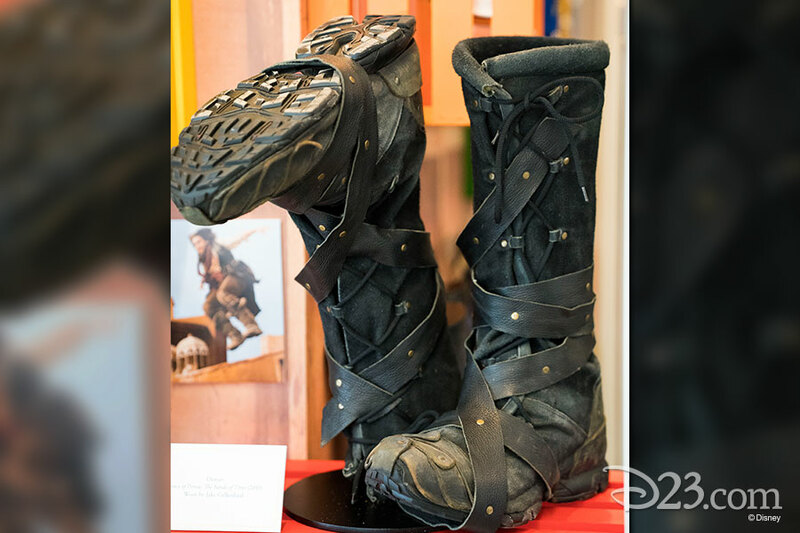 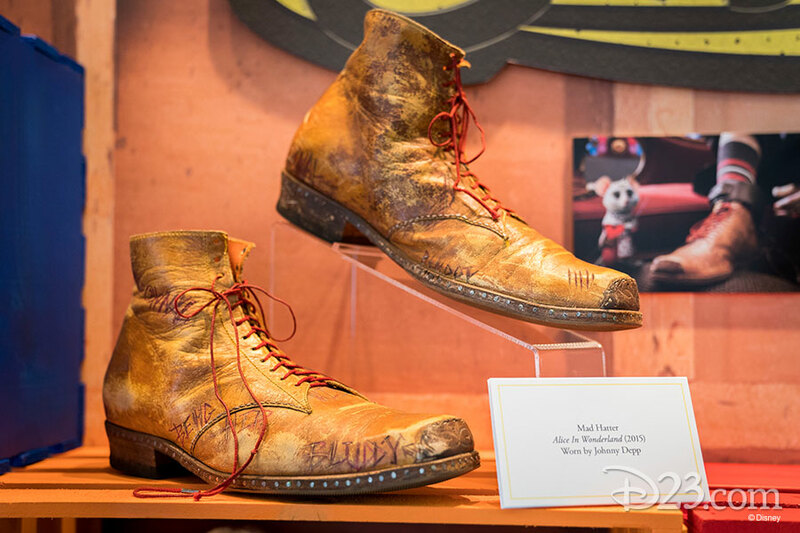 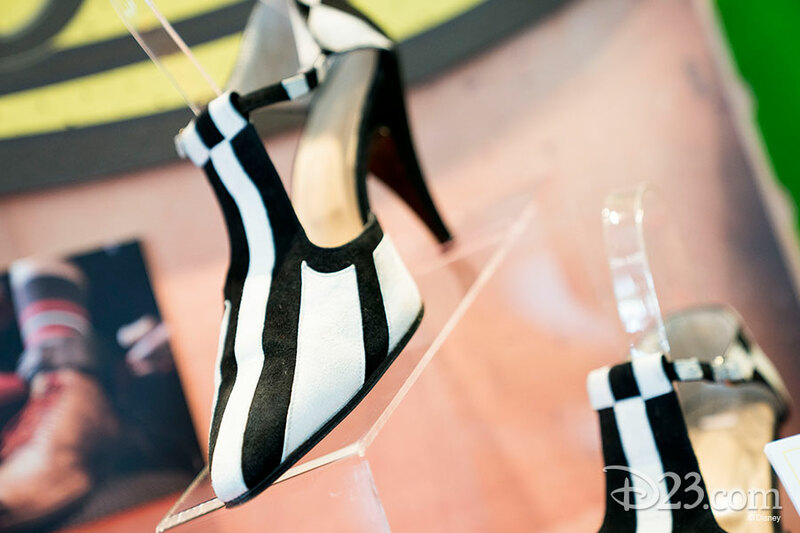 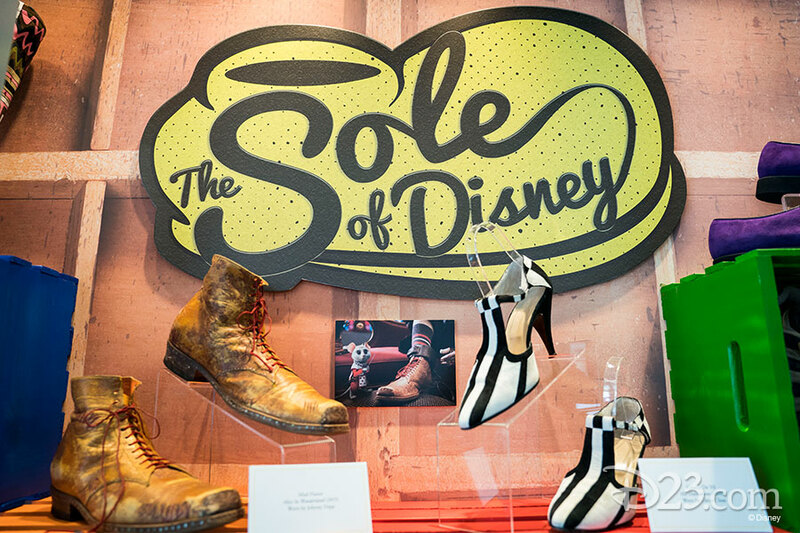 The Sole of Disney features more than 40 pairs of fashionable footwear on display in the lobby of the Frank G. Wells Building at The Walt Disney Studios. 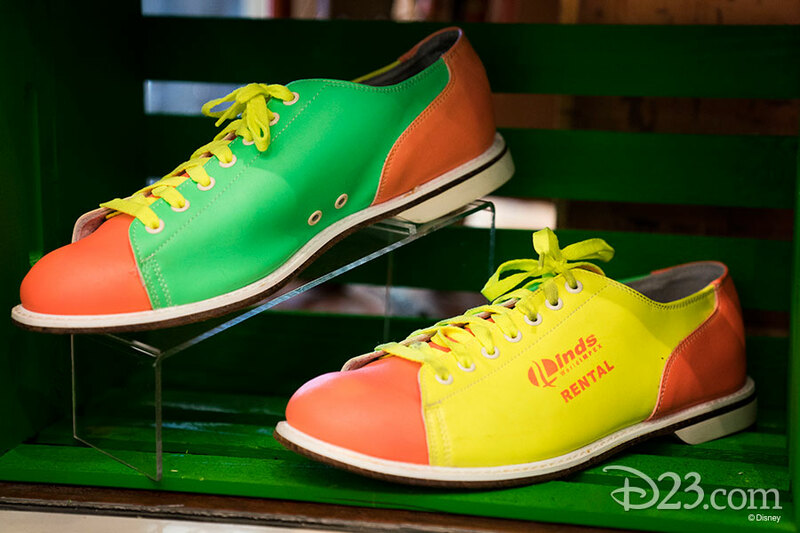 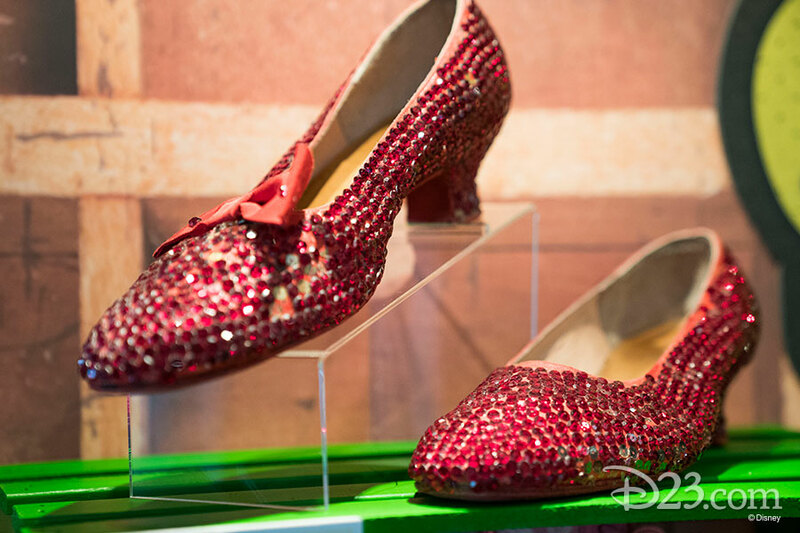 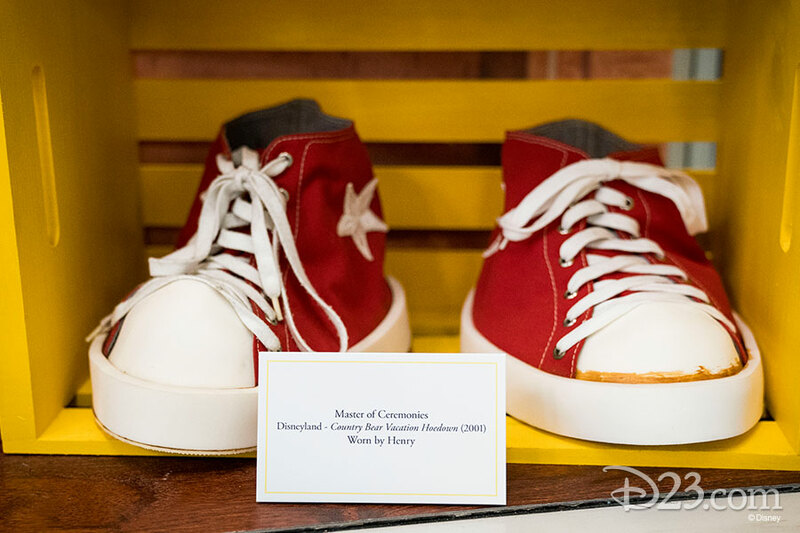 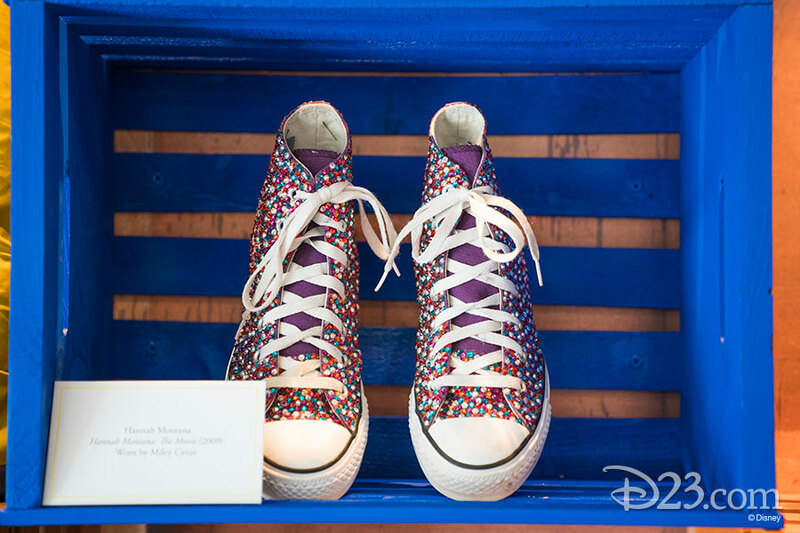 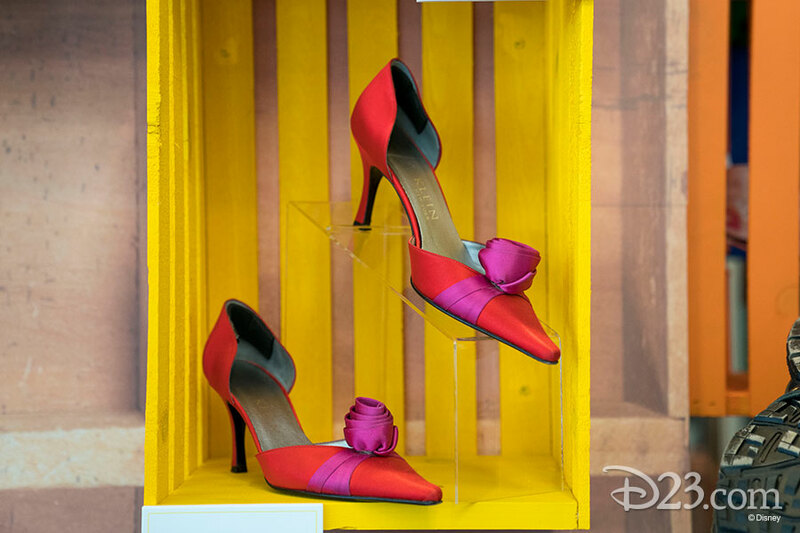 Some of the most recognizable characters and personalities in Disney history have walked, danced, and strutted their stuff in an amazing collection of stylish shoes. 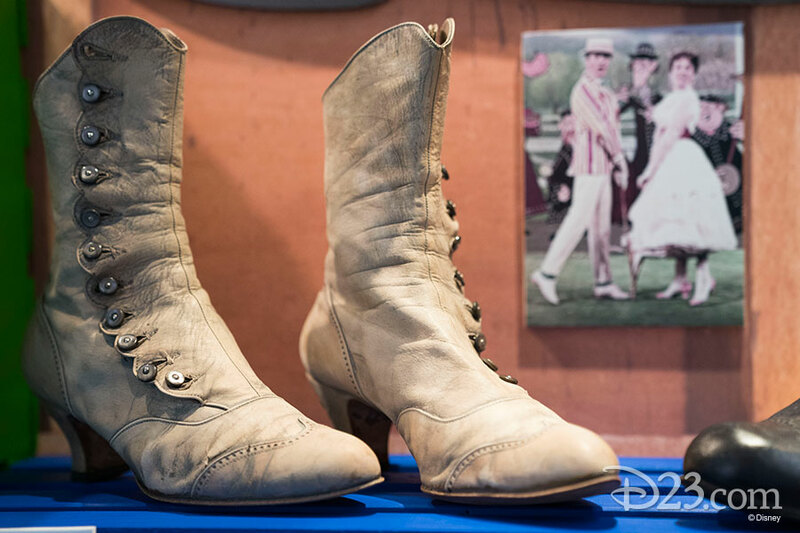 There are stylish white boots worn by Julie Andrews in Mary Poppins (pictured above) as she strolled through the countryside on a “Jolly Holiday.” Queen Narissa (as portrayed by Susan Sarandon in Enchanted) stopped traffic in New York City when she crossed the street wearing thigh-high blue iridescent platform boots. 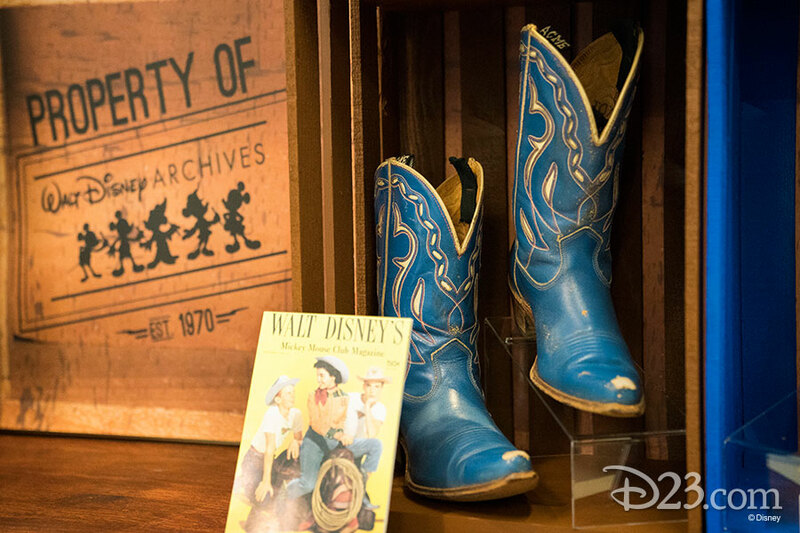 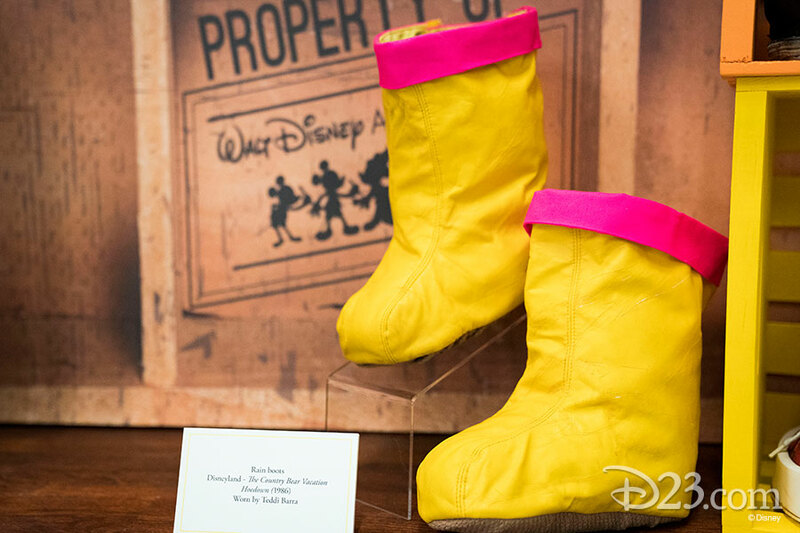 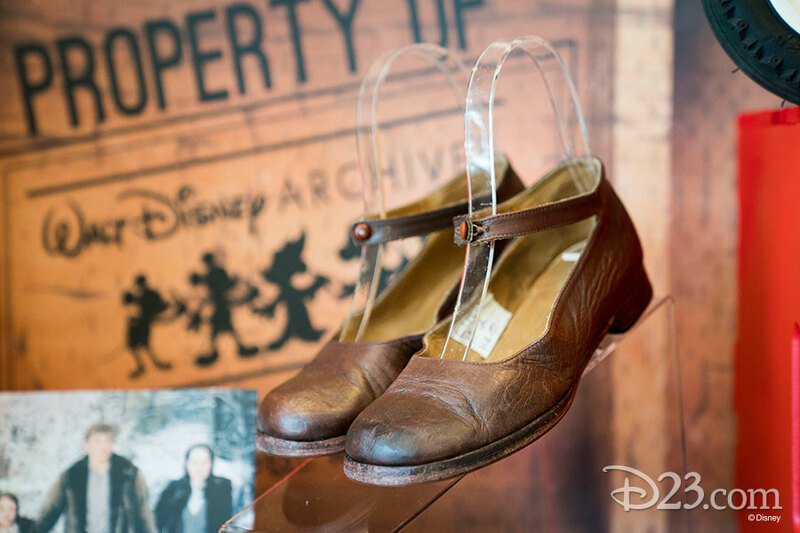 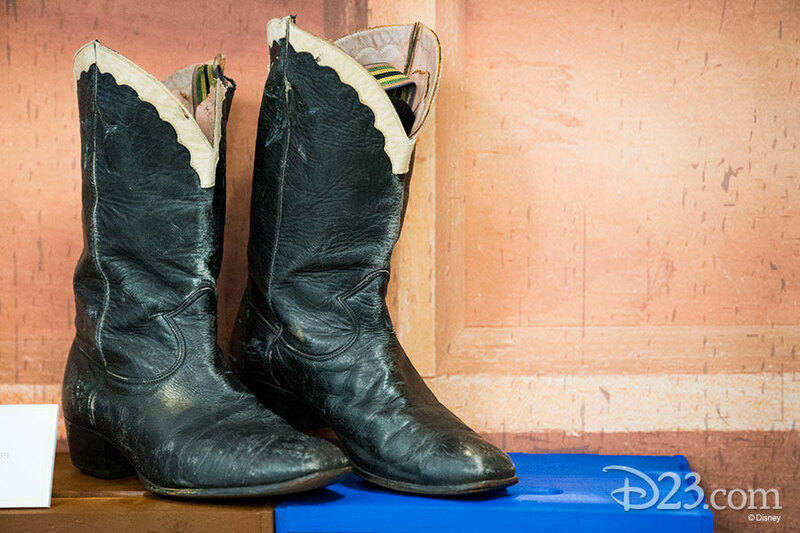 Three pairs of cowboy boots represent some of the earliest costume pieces acquired by the Walt Disney Archives. 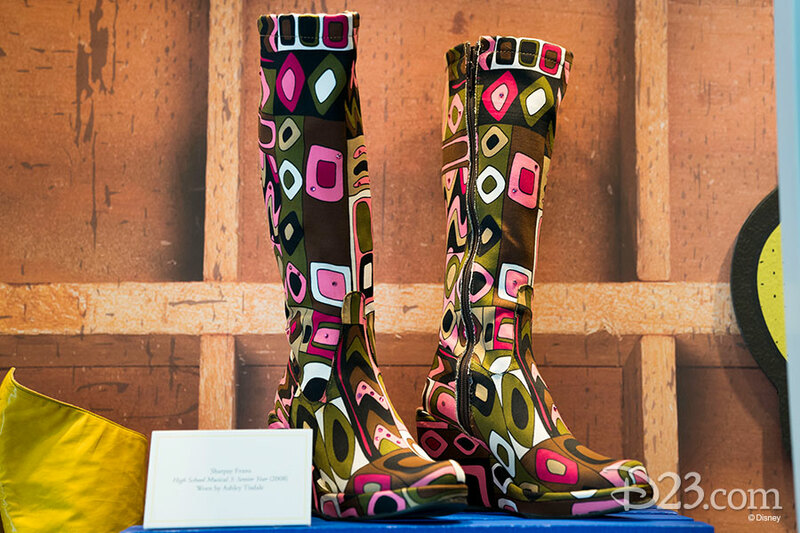 Black boots with a white trim across the pullstrap have the handwritten name of Roy Williams on the inside. 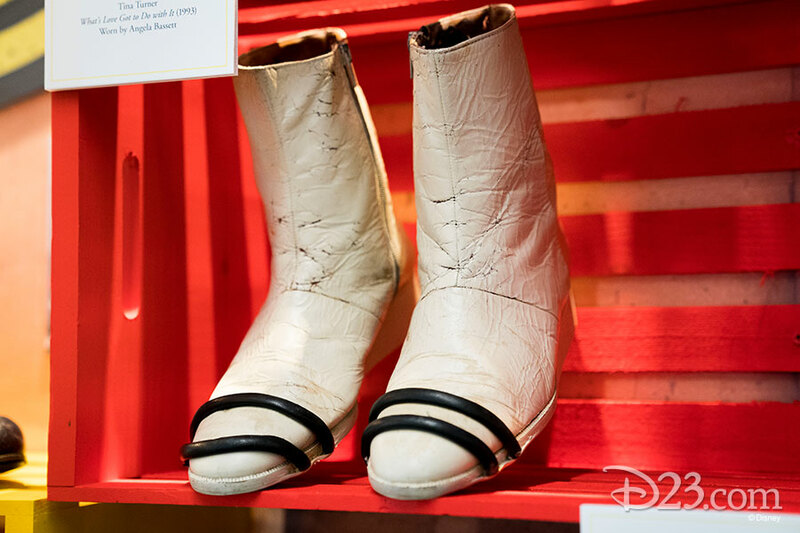 Roy, the “Big Mooseketeer” of the Mickey Mouse Club wore the boots during episodes of “Talent Roundup Day” episodes. 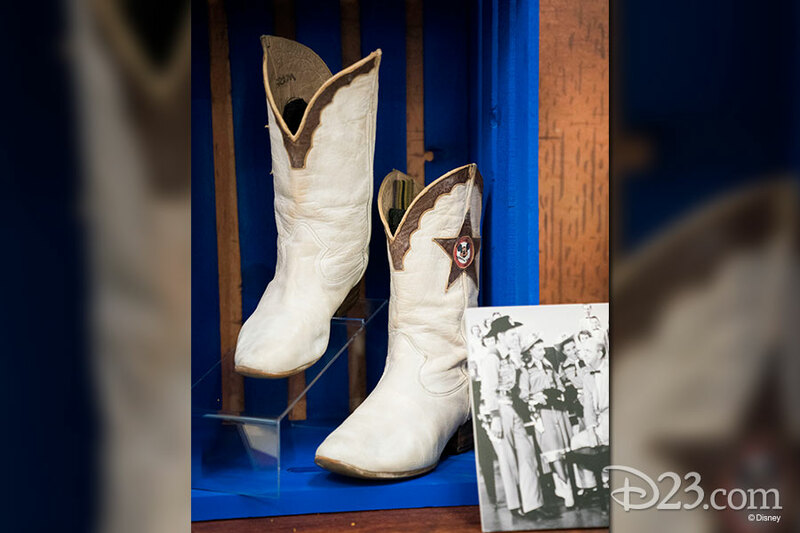 Another original Mouseketeer, Doreen Tracy, wore white boots (pictured above left) with a Mickey Mouse Club logo on the side during her appearances on “Talent Roundup Day.” The Further Adventures of Spin and Marty gave Annette Funicello a chance to mosey around the Triple R Ranch in stylish blue cowgirl boots with yellow stitching (pictured above right). 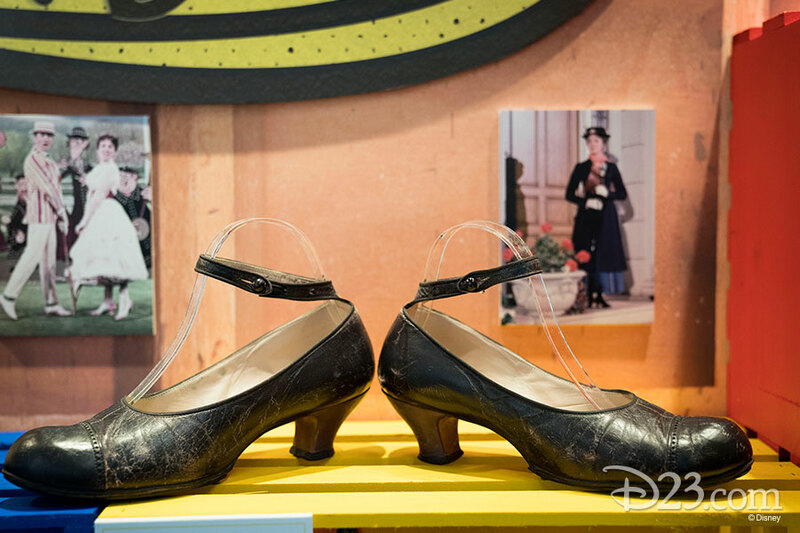 The smallest pair of shoes on display surprisingly does not belong to Lucy Pevensie (Georgie Henley, The Chronicles of Narnia: The Lion the Witch and the Wardrobe). 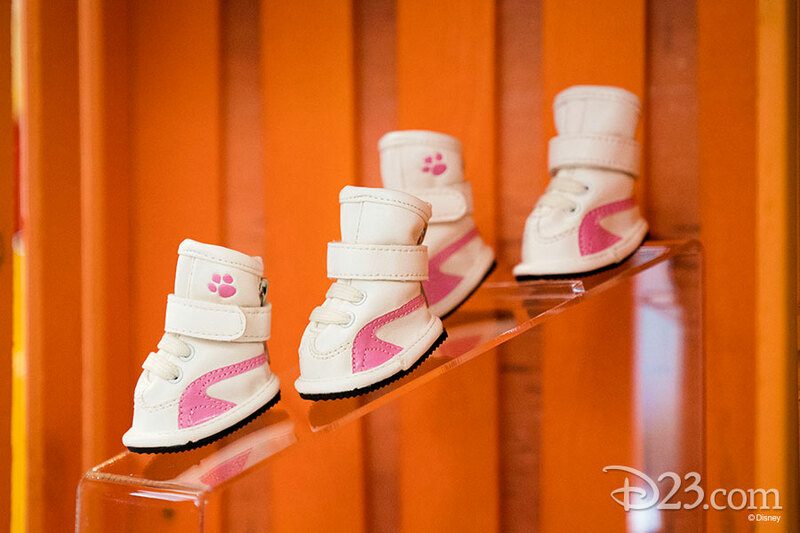 Chloe (Beverly Hills Chihuahua) has the honor of walking in not just two, but four pink and white sneakers (pictured above left)—the tiniest shoes in the Walt Disney Archives costume collection. 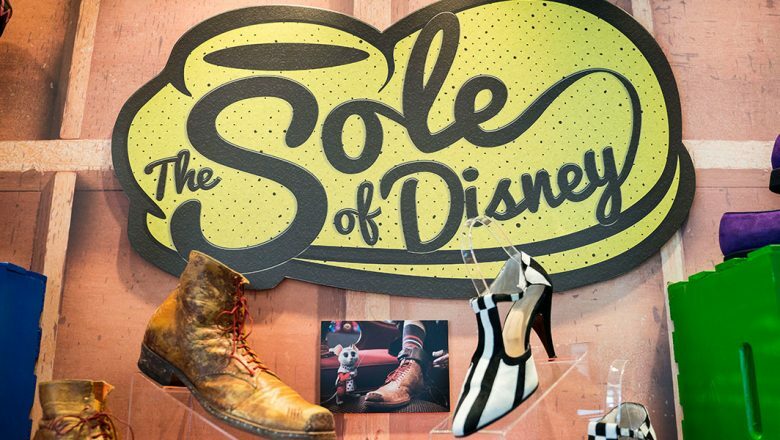 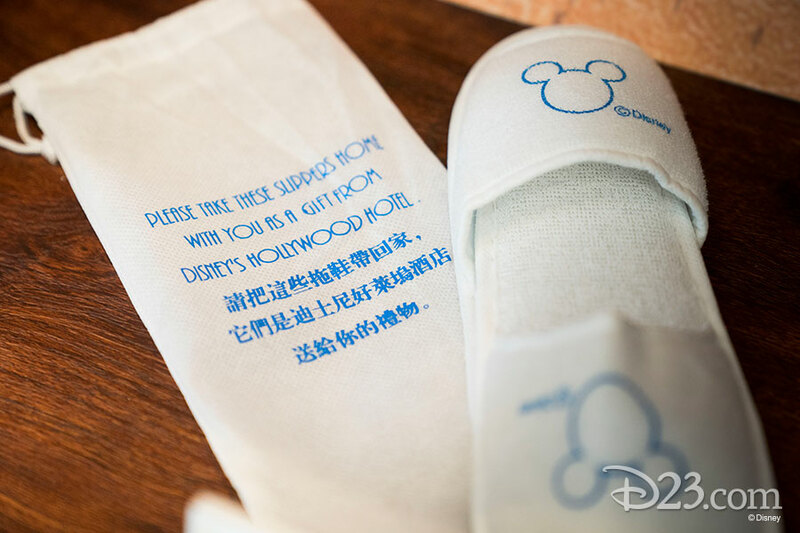 And it’s not just stars of film and television who have amazing “soles.” Remember swinging Teddi Barra from The Country Bear Vacation Hoedown? 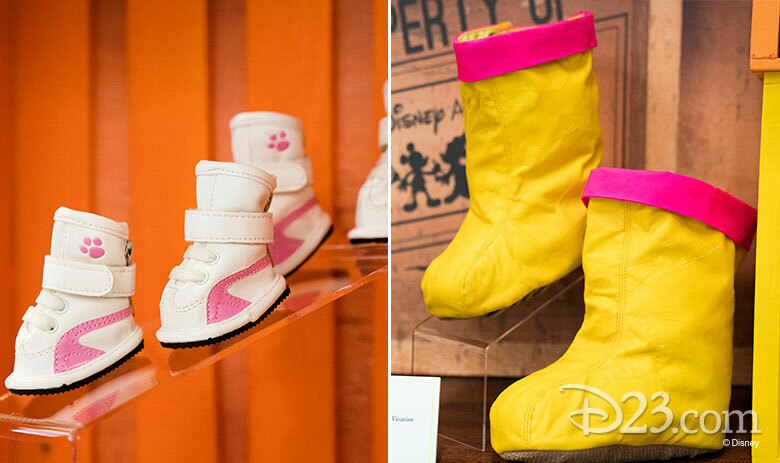 Her bright yellow rain boots (pictured above right) with a fluorescent pink trim are surely one-of-a-kind! 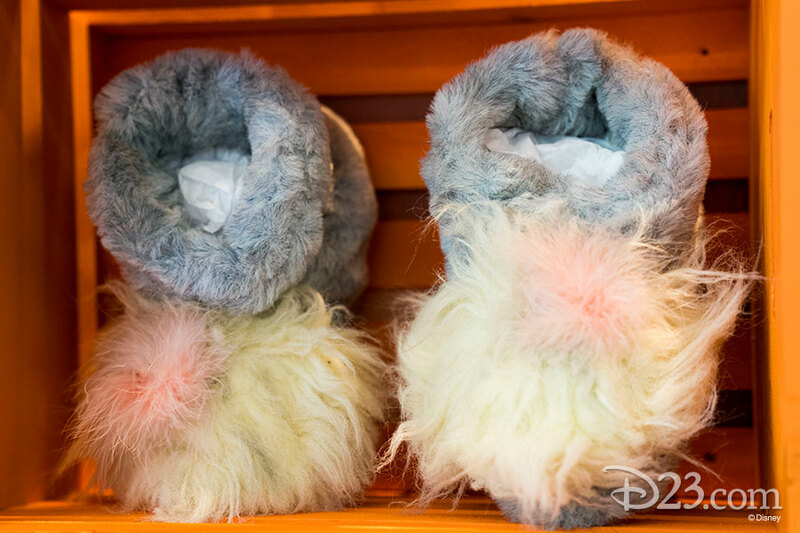 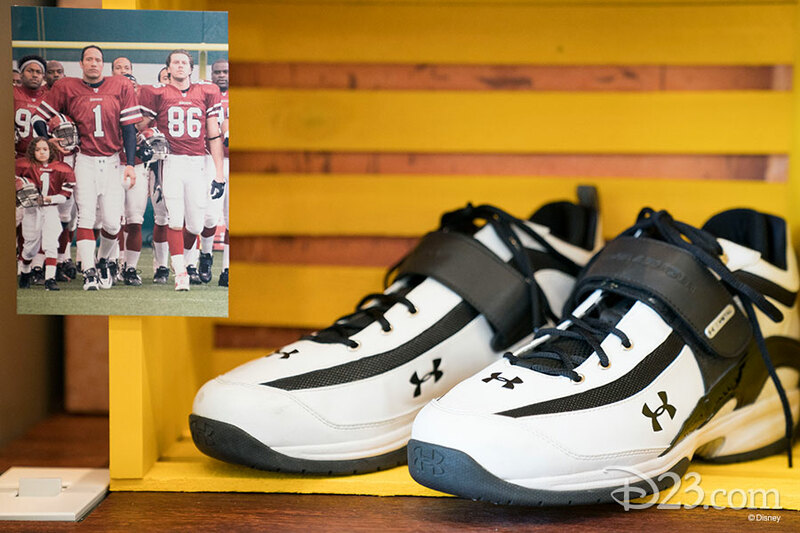 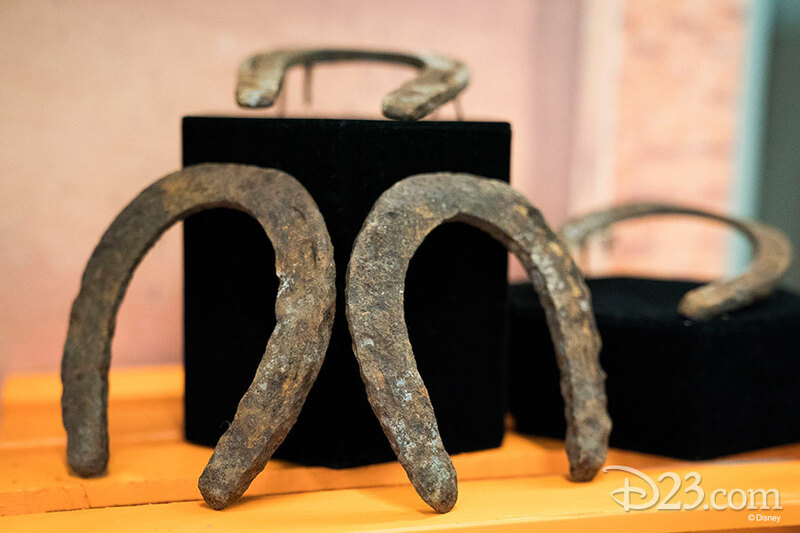 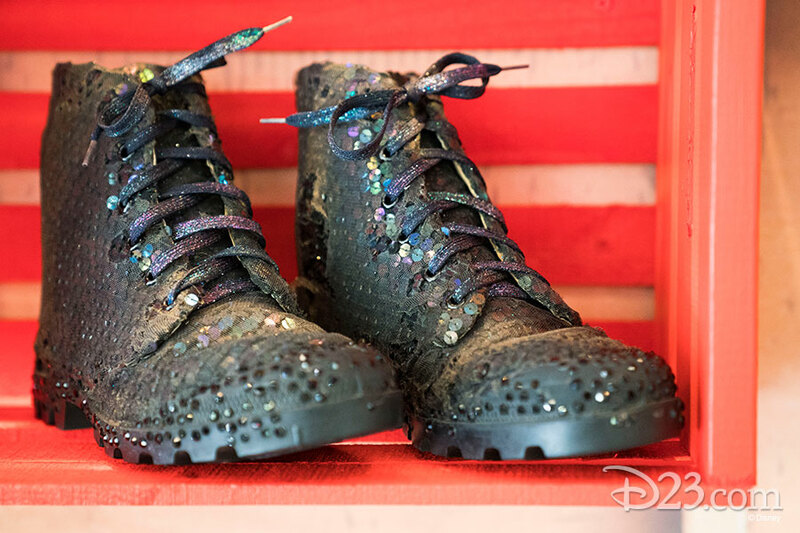 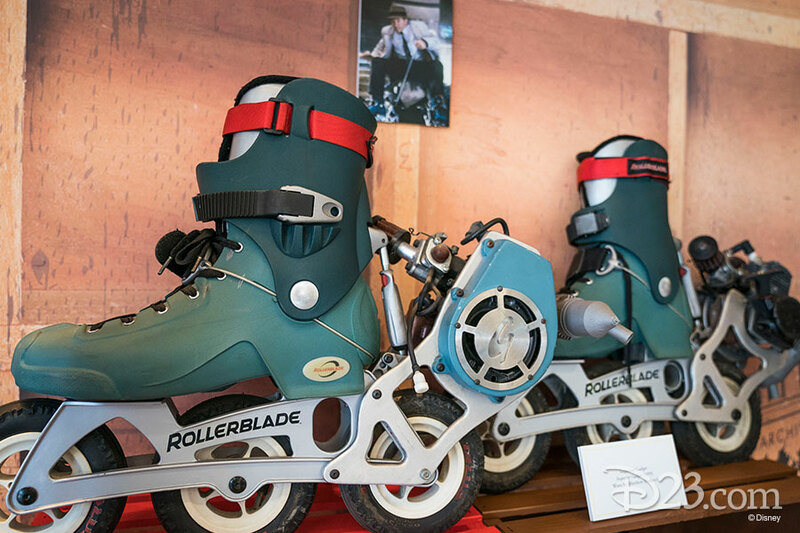 Also representing Disney Parks and Resorts is a set of four mule shoes (pictured below left) used in the former Pack Mules Through Nature’s Wonderland attraction at Disneyland. 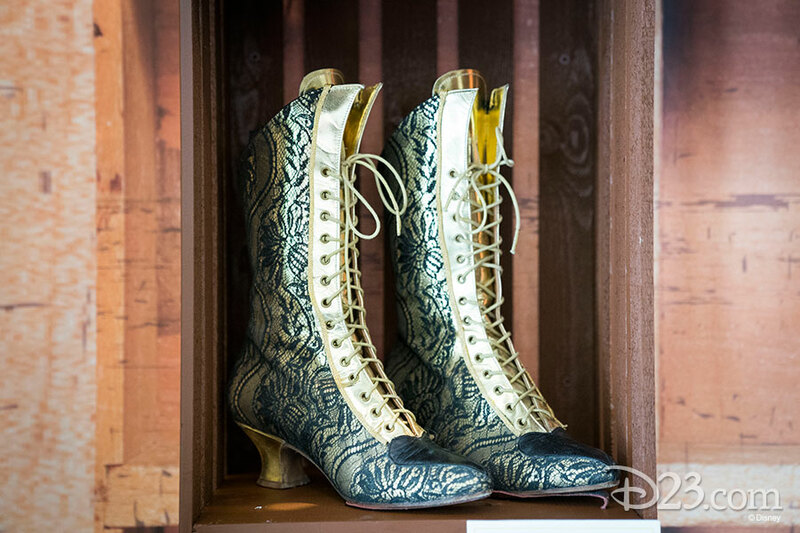 Some costume designers walk the extra mile when it comes to designing a unique but practical pair of shoes. 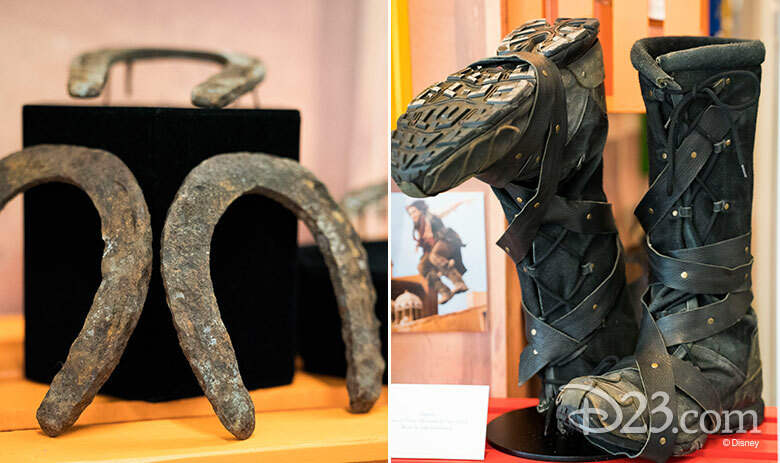 Dastan (Jake Gyllenhaal, Prince of Persia: The Sands of Time) jumped and raced across the desert in a pair of regular black sneakers (pictured above right). 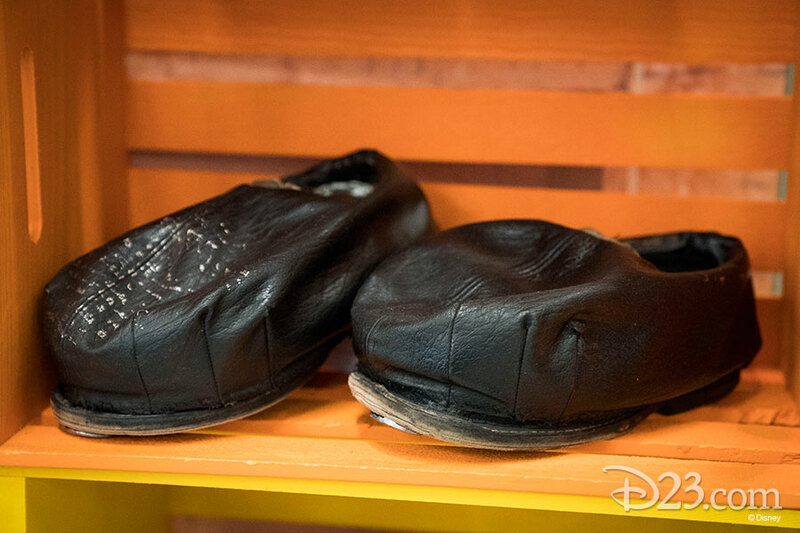 The common everyday shoes were redesigned and built upon to create the more appropriate (and comfortable!) 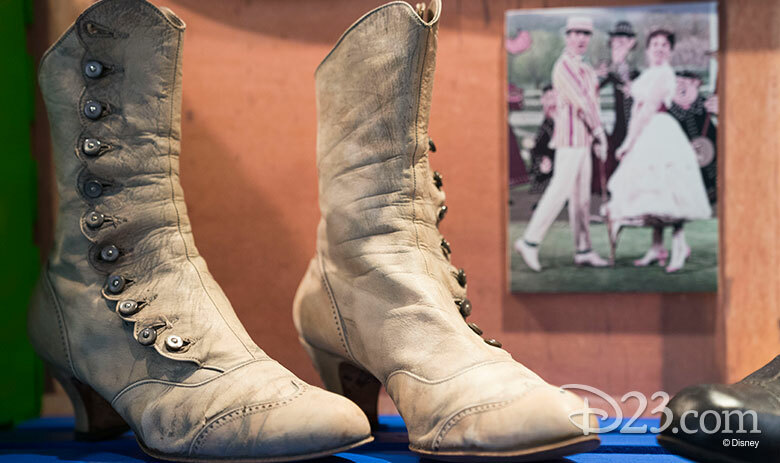 period costume of black leather boots. 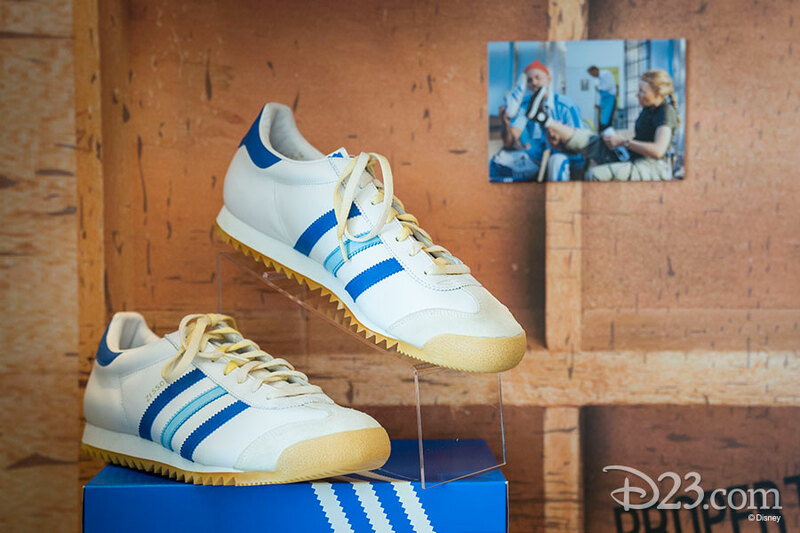 So, whether your taste in footwear is a pair of practical Adidas sneakers (The Life Aquatic with Steve Zissou) (pictured above) or the more expensive Jimmy Choo high heel of Verla Grubbs (Carol Burnett, All My Children), enjoy this photo gallery of the new exhibit, representing the “adventures” experienced by some of Disney’s most famous characters. 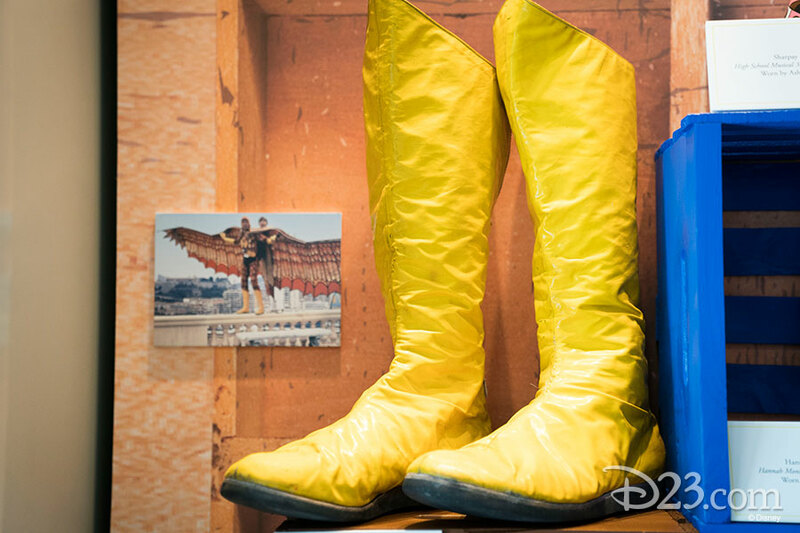 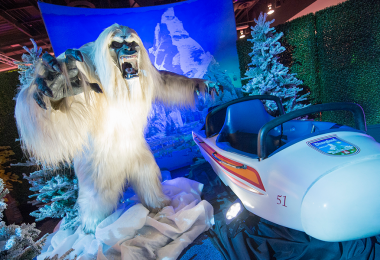 D23 Gold and Gold Family Members have the opportunity to visit the Walt Disney Archives as part of The Official Walt Disney Studios Tour—Presented by D23. 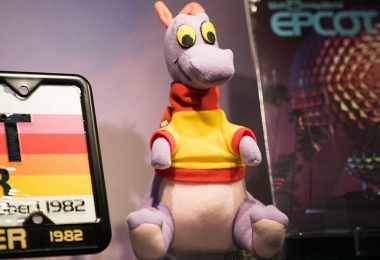 Check out upcoming tour dates on D23’s lineup of events for 2018!